Over the month of May we highlighted various economic indicators largely based around business sentiment data. The evolving pattern in this sector has been one where sentiment has pulled back from very high levels. We have also stressed that while the pull-backs have produced negative headlines, business sentiment remains robust with recent softening being normal. This week we look at economic prospects from the consumers’ perspective, to see how confident they are about the future. 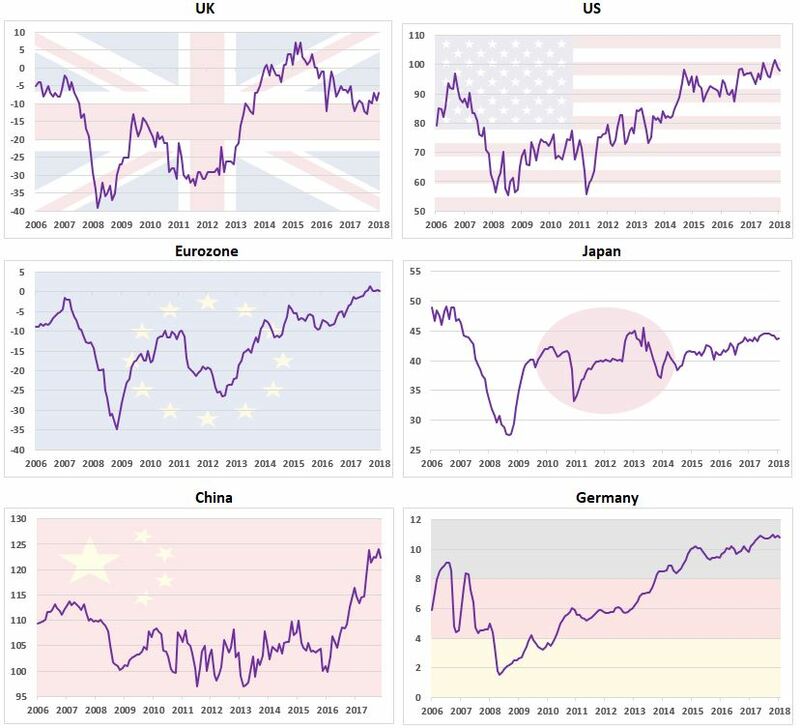 Consumer confidence indicators are produced by different agencies in different countries but they all track sentiment across a random sample of households using a similar methodology. The indicators are gauging whether consumption through consumer spending is likely to increase, savings decrease and economic growth advance based on levels of confidence. In the charts below, we depict the global picture emanating from consumer confidence surveys. Source: GFK, University of Michigan, European Commission, Economic and Social Research Institute Japan, National Bureau of Statistics of China, 31 May 2018. Vertical axes represent respective index values applicable to each country. It is evident from the surveys that consumers in the US, Europe and China are growing in confidence. 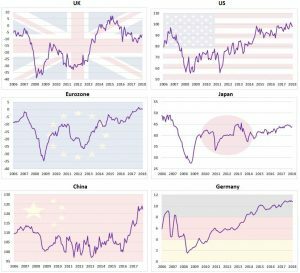 Global economic growth has staged a strong recovery since the 2008 financial crisis and this is feeding positively into consumer expectations. Technological advancements and better global infrastructure have benefited consumers but these aspects have evolved in different ways globally. The picture shown above for Japan and UK is different. Japan’s ageing population, through low birth rates and high life expectancy, is creating challenges. As a general observation, ageing populations tend to consume less. UK consumers have been dealing with a squeeze in real disposable incomes, with inflation growing faster than average earnings. However, the negative trend in real disposable income (after taking inflation into consideration) has started to recede. Experience tells us that when wealth effects improve, consumer confidence follows suit. Of course, there are other variables influencing household incomes, such as rising oil and petrol prices. They act like a tax on consumers. 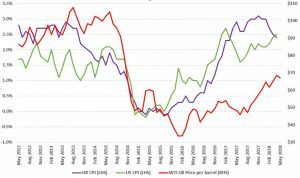 The oil price chart below shows how much of an impact oil prices have on inflation rates for the US and UK. When it fell sharply to reach a 13-year low in 2016, inflation also fell. However, its recovery has also contributed to higher inflation. Two weeks ago, we provided an update on the Italian elections. At that time the two populist parties, the League and the Five Star Movement, were forming a coalition. Matteo Salvini and Luigi Di Maio, leaders of the League and the Five Star Movement, nominated their candidate to be finance minister. However, their choice received a big (emperor) thumbs down from Sergio Mattarella, the Italian President. The person nominated is Paolo Savona, an 81-year-old Eurosceptic economist. Savona is a man who has made his feelings clear on the Euro, stating in 2015 that Rome should create a “plan B” to exit the Eurozone. The ability of the Italian President to exercise veto powers is vested through the post-war constitution but his decision to use those powers is proving highly controversial. He has reasoned that Mr Savona’s policy objectives pose a threat to the savings of Italian citizens. As we go to print a new deal has emerged. The coaltion is now able to form a government but with a new finance minister Giovanni Tria, an economics professor who has not advocated leaving the EU. The graph below shows the yield on the Italian 2-year bond, most commonly used as an indicator of political risk. The rejection of Mr Savona was certainly felt in financial markets as yields rose 2.4% over a four-day period. After Sergio Mattarella’s late efforts to stop the coalition from collapsing through to the eventual appointment of Giovanni Tria, investors’ perceptions have changed shown by the 2.0% drop in yields. The alliance between the right-wing League movement and the populist Five Star party is something that will continue to court controversy and encounter the full force of European Union coercion. The EU’s initial attempts to influence proceedings in Italy have been clumsy, meeting fierce resistance. What is clear in all of this is that we are only at the beginning of what will undoubtedly become a fascinating tug of war between Brussels, with its vision of an extended, integrated Europe, and Rome, with a much more nationalistic agenda. For Italy’s coalition government’s agenda to be fulfilled, it requires more spending, more borrowing and greater EU assistance with Italy’s migration problems. The European Commission (EC) had a busy month in May deciding how to distribute its budget of €330 billion in commitments for 2021 though to 2027. This is handled through its so called ‘Cohesion Policy’. The goal of the Cohesion Policy is quite a mouthful – “drive up economic and social convergence while helping regions harness fully globalisation and equipping them with the right tools for robust and lasting growth”. We cannot begin to imagine what goes on behind the scenes but imagine a high degree of ‘horsetrading’. Any decision to redistribute the budget is bound to meet with great resistance and sow division! Recent reports on proposals point to some politically inspired shifts in the way the budget is to be distributed. Support for Central and Eastern European (CEE) member states remains high but the Commission has decided to recommend shifting over €30bn from them in favour of the EU’s southern states (Greece, Spain, Italy). According to the EC, the southern states are “still lagging behind in terms of growth or income”. The changes in funding are big but officials say they are being careful to avoid even larger cuts by capping them at a maximum of 24% of the previous amounts. They are also restraining increases, to a limit of 8%. 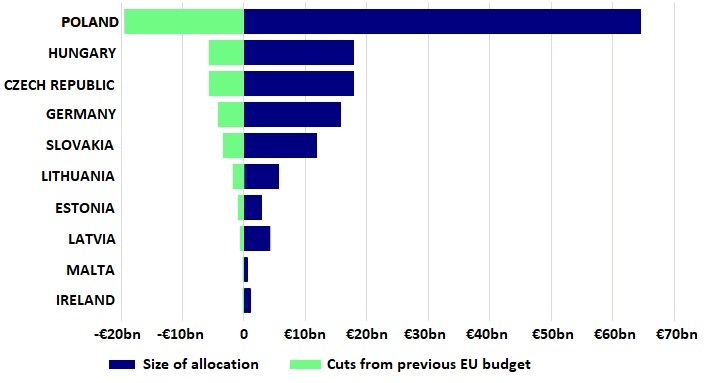 Without the cap and restraints some countries would have seen astounding cuts, some as high as 45%. 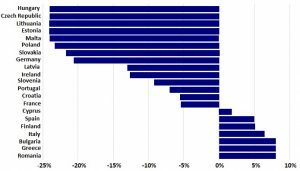 While CEE countries are still getting more from the budget in terms of euros per capita, opposition from Poland, Hungary and Czech Republic, who will be seeing less money flowing to them, is hardening. At the same time demands from countries like Spain, Italy and Greece for greater assistance are growing louder. With any redistribution there are always winners and losers. In this case it is difficult to avoid concluding that those getting more will want even more and those receiving less will feel extremely aggrieved. Sticking plasters do not work when applied to gaping wounds. Meanwhile, to try and inspire cohesion, the European Commission released the White Paper showing five scenarios for Europe by 2025. The underlying thinking is that with all 27-member states moving forward together as a Union, all five scenarios are positive.